The May fly is up! 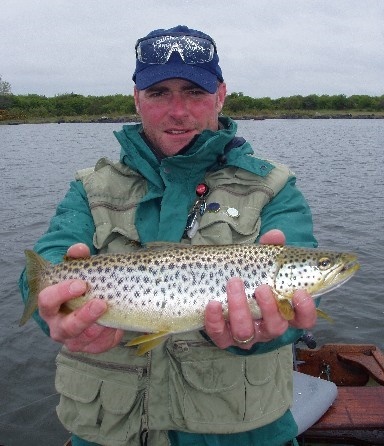 This is the yearly call that in Ireland brings almost every lough angler to arms, for the trout angler and perhaps the trout this is undoubtedly the high point of the season. This aquatic insect that has been the name of so many pubs, restaurants and hotels, and has also been the topic of legions of books and poems, and is probably the one thing that stirs the lough trout angler into heading for, or at least wishing they were heading for one of Irelands great limestone loughs. Loughs like Corrib, Mask, Conn, Sheelin, Derg, Erne and Melvin to name just a few. To me there is something truly magical about the mayfly, the freshly hatched dun has an almost fairy like quality, flitting and dancing on the waves it reminds me of Tinkerbelle from J. M. Barrie’s Peter Pan, or watching the spinners doing there mating dance, above an island on a wild lough, sometimes there is so many it’s, like smoke rising from the trees, it is a truly fantastic and fascinating time. The mayfly is just loved by angler and trout alike, but the name mayfly, can be very misleading as the mayfly season can on some Irish loughs begin as early as the middle of April, but normally middle of May into the first or second week of June is the time, although I have seen and heard of sparse hatches happing as late as September, so it’s always a good idea to have a few mayfly patterns with you no matter what time of year you go afloat, you just never know you might come across an unsuspected hatch with trout feeding on them . Fishing the mayfly has been called, at its peak ‘’the duffers fortnight’, but I tend to disagree, yes the fishing can be very good if not amazing, but that’s if you time it right and I have been luckily enough to have had some great days on lough Erne and other loughs, but for so many anglers, especially the poor unfortunate ones that don’t live beside one of the loughs or is plagued by such a thing as a full time job, mayfly fishing can be a very hit a miss thing, I myself am a member of an angling club, The Mallusk Angling Society from Co.Antrim, which for as long as I can remember book four days on a lough around the end of May as their annual club outing, the club picks the end of May hoping to hit the mayfly time just right, this club has a lot of very good and experienced anglers, but with the unpredictable weather in Ireland. If the weather conditions are not right the fly will not be up, as the song says we often get four seasons in one day, so to try and book a year in advance and to get conditions with a fly hatch right is almost an impossible task. There has been a few times when the club ‘have hit it right’, but more often than not the club has been too early or too late for the fly, or the weather has been awful, as anglers we have all heard the saying ‘you should have been here last week’, and it can sometimes be very annoying when being told to you by some grinning local. But there are other factors to fishing weekends, club members keep coming back year after year and they always seem to have a great time, they certainly keep the local bar, a certain Wattys Rock pretty busy, they have been going so long Wattys Rock Bar is a place where they are all treated like part of the family, this may sound strange but in Ireland mayfly fishing and the culture that goes with it is not all about catching trout you know, some of its charm is about the warm welcome and the ‘criac’, the annual pilgrimage to a beautiful place also there is always that chance that you may hit it right when the fly is up and the conditions are right, this will bring many visiting anglers coming back year after year to the Emerald isle. Now if you do hit it right or even nearly right, the fishing can be real heart in the mouth stuff. Normally when the fly starts hatching the trout take a few days to switch onto the dry fly, they begin feeding on mayfly in all its life cycles, firstly the nymphs. Later they take the emerging fly, the hatched dun or ‘green drakes’ as they are called and then the spinner or spent (gnat) which is normally in the evenings this to many can be the cream of the fishing. The dry fly in recent years is probably the most popular way of fishing and when it is right, there is nothing better than watching trout rising to dry flies. I normally fish two flies during the day, a dun and a spent, even if there are no spent around as the trout just can’t seem to resist the spent fly, the dun is the one you can normally see better with its upright wings and this may help if fishing in a rolling wave you can use it as your sight fly, takes can be anything from a confident sip to fish rolling over your fly , the hard part is to time your strike or probably better described as your lift , lift the rod to early and you can pull the fly away from the fishes mouth to slow and the trout may have sucked your fly in and spat it out, before you have realised. I know anglers that mutter ‘ God save the Queen’ and I know others that say ‘up the republic’ in these times of political correctness maybe it’s best counting to three before you lift your rod to set your hook, at least until you get to know your boat partner or boatman . Although dry fly fishing at mayfly time is probably the best loved way to fish sometimes conditions favor wet fly fishing, I also know a few anglers who don’t have the patience for the dry fly, they would much rather be pulling flies and there are days when traditional wet style pulling flies will take just as many trout, if not at times more, so they must never be forgotten. Also don’t forget the nymph fishing, heavy nymphs take a lot of trout especially on very bright days when the trout don’t want to rise; a long shank size ten or even a size eight Hare’s ear nymph can be particularly good and has saved the day for many anglers. I know there is a lot of anglers at this time of year may have two rods set up in the boat, as long as it’s not a competition, where this would normally not be allowed, a rod set up for traditional wets and nymph fishing, this would be a rod of ten to eleven feet in length which is needed for traditional wet-fly fishing, as there can be three or even four flies on a long cast, so you need the long road to give you the height to work the top dropper fly or bob fly across the top of the waves, this rod normally will be matched with a number five to seven floating or intermediate line. The second rod would normally be a nine foot six or a ten foot rod maybe a little stiffer in action matched for a six or seven line, set up with a cast of one or two dry flies. As for your tippet remember to bear in mind the chance of meeting a big wild fish, especially if you are fishing on one of the limestone loughs, so go for no lighter than 6lb when choosing leader strength, I know many good lough anglers that never fish any lighter than 8lb and think you have lost your marble’s if you tell them you fish with a lighter tippet. As for flies there are many good fly patterns and there are many books that will show you some great lough style patterns, Peter O’Reilly’s Flies of Ireland, E.J Malone’s Irish Trout & Salmon Flies, Kingsmill Moore’s a man may fish and Patsy Deery’s Irish Mayflies are all worth a read. There is also dapping or what we call fishing the dap,.—’Dapping’ with the natural insect using a long rod and blow line, a very light floss line this is a popular method which evolves the angler holding his rod high in the wind to make his fly dance and flitter across the waves.. The live mayfly are picked by hand along the shoreline and from the bushes and trees and kept in special wooden box most of which are passed from one generation to the next. Dapping is a very early method of fishing, one of the earliest uses of the word is in Izaak Walton’s ”Complete Angler” in 1653. In a description of the critical aspect of the dapping technique, he wrote, ”Let no part of your line touch the water, but your fly only said of dapping it is a deadly way of fishing small overgrown brooks. A stiff rod and strong gut are necessary, and he was right but it also can be deadly on loughs. Needed for this method is a steady wind and nerves of steel, it can be most exciting as deadly method, as the natural fly is very killing bait for trout. There are a few things you should remember while fishing in Ireland on her wild loughs. Irish loughs can be very big and normally are very rocky; they can be hazardous places when swept by the strong winds. A boatman/guide is the best guarantor of safety, but even so each angler in a boat should always wear a lifejacket. Anglers who go afloat without the aid of a boatman/guide should only do so with great care after taking local advice.